Ideal for brighter toned instruments, especially with maple and ebony fingerboards. Designed jointly by Seymour and humbucker inventor, the late Seth Lover. Just like the original 1955 P.A.F.s, the SH-55 utilizes a nickel-silver cover and long-legged nickel-silver bottom plate, butyrate plastic bobbins, plain enamel wire, Alnico 2 bar, wooden spacer, and black paper tape. To be completely true to the original design and tone, the pickup is not wax potted. The tone is vintage P.A.F. The unpotted cover gives a slightly "honky" microphonic quality. Vintage-style single conductor cable standard. 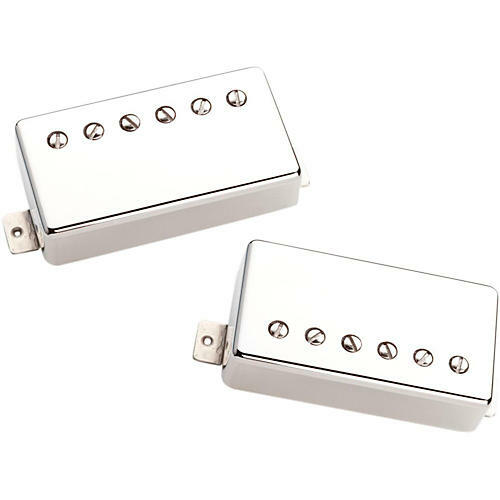 The Seth Lover Humbucker Pickup Set is most commonly used in a neck and bridge set and can be used in the neck with an SH-11 Custom Custom (sold separately) for heavier rock sounds from the bridge position. Order this special Seth Lover humbucker set today!